Jupiter glows the brightest in this photo, appearing above the horizon and clouds toward the left. The constellation Orion can be seen above right with its second brightest star, Betelgeuse shining in orange. Miguel Claro took this photo on Jan. 24, 2014 from Los Andenes, La Palma, Canary Islands. The brilliant planet Jupiter and constellation Orion shine brightly in this glittering night sky photo shot from the Canary Islands. Astrophotographer Miguel Claro captured this stunning image from the pristine viewing site of Los Andenes, La Palma. The emission nebula Barnard's Loop, and giant star Meissa (or Lambda Orionis) can be spotted in this view, as well as the Flame and Horsehead nebulas. 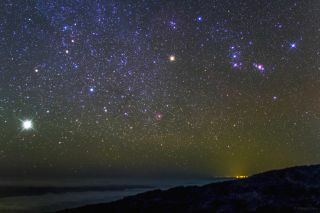 The Iconic Running Man nebula and Great Orion Nebula can be seen toward the bottom of the photo. Open Cluster NGC 2175, also known as the Monkey Head nebula, can be seen between the right center and corner of the image. The Rosette nebula lies near the center. Claro used a Canon 60Da camera to take the photo (ISO 1250; 24mm at f/2; Exp. 49 seconds). A star filter was used in front of the lens to create the "spikes" seen in the stars. It was sent to Space.com on Jan. 24. Follow us on Twitter @Spacedotcom. We're also on Facebook & Google+. Original article on Space.com.